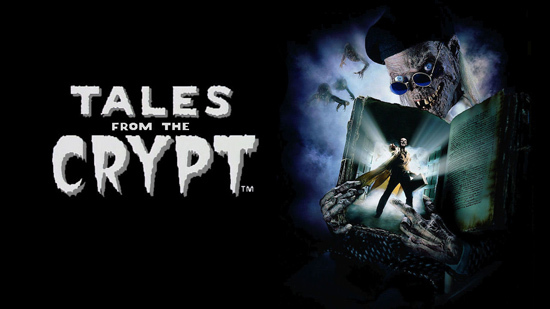 TALES FROM THE CRYPT returns; are we headed for anthology overload? The marketplace is about to get very crowded, as U.S TV bosses remember how cool and popular the anthology genre once was... and could be again. I mean, given how many amazing television shows there are right now, jostling for your time, it's true that some very good shows are being forgotten about and cancelled (ahem, Hannibal). It's just impossible to watch everything, no matter how many friends recommend you something with a half-crazed fever in their eyes, even with the aide of modern-day catchup TV, box-sets, and streaming services. Maybe the anthology genre is being seen as the perfect antidote to the 'Peak TV' concern, because it only requires episodic commitment and watching things in order isn't necessary? Anthology shows like Tales of the Unexpected were a mainstay of television for decades until the genre lost its footing in the mid-90s, and have been left fallow ever since... but it seems the success of the UK's Black Mirror has inspired an unexpected revival. I'd love to credit Inside No.9 with this turn of events, too, but unfortunately that dark comedy remains a cult hit on British shores only. Soon after, NBC announced they're reviving Steven Spielberg's '80s anthology show Amazing Stories, with Bryan Fuller (Pushing Daisies, Hannibal) in creative control. And just this week, HBO's Tales from the Crypt (1989-96) has found a new home on TNT with M. Night Shyamalan (The Sixth Sense, Unbreakable) unveiled as showrunner. Is this all too much? Maybe. But it helps that each of those shows have different tones—if we're to believe the latter two shows will follow the original shows' leads. Black Mirror is very adult and nihilistic, with a clear focus on the perils of modern technology and its future applications. Amazing Stories was lighter and family-friendly, so knowing the revival is still produced by Amblin makes it seem likely that will still be its core value. Tales from the Crypt was always very horror-focused and felt like something aimed at teenagers, and TNT have already stated they're taking their cues from the comics more than the '80s TV series. Shyamalan directed the pilot of Wayward Pines last year (a series that had a very Outer Limits vibe to it), so I predict he'll aim for something similar: dark, eerie, but not R-rated like the first show was. Of course, one question these developments beg is: when will the granddaddy of anthology series get remade? Yes, I'm talking about CBS's The Twilight Zone. How can this revival be happening without that show involved? Rod Serling's ground-breaking classic arguably kept interest in the anthology genre going for three decades, but there's been no announcement of a revival... yet. Maybe CBS aren't interested in bringing it back, seeing as Twilight Zone has already been revived twice (1985-89; 2002-03), and the latter attempt on UPN with Forest Whitaker hosting was a big flop. Interestingly, in 2012 we heard that Bryan Fuller was circling a proposed third remake of The Twilight Zone, but the fact he's now involved with Amazing Stories suggests this project just wasn't coming together quickly, so he's scratching his anthology itch elsewhere.